Madou Monogatari is a series of fantasy role-playing games for Sega Game Gear. I have always been a fan of games like Wizardry, Eye of Beholder and Final Fantasy, and I have to say that I like Madou Monogatari a lot. The game is Japanese and I don't understand a word, but it easy to learn how to play, because there are no numeric stats. Everything is represented by character facial expressions and sprites. 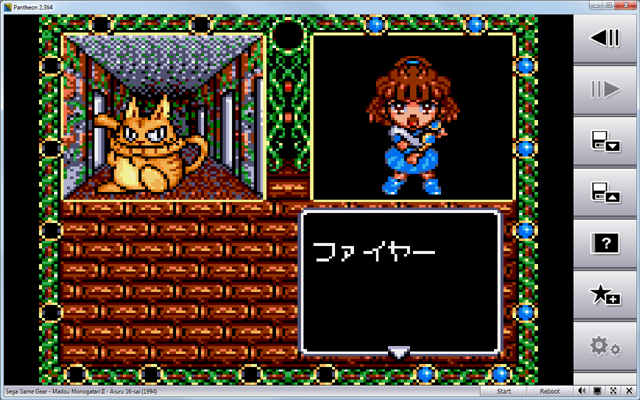 Madou Monogatari series of games will be available in next release of Pantheon.